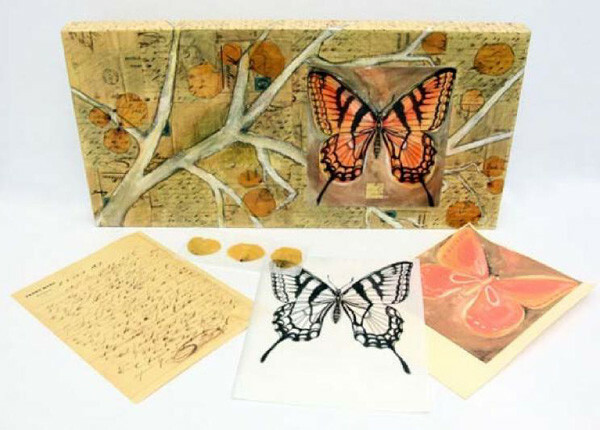 Project Description: Creating collage art doesn’t have to be complicated or overwhelming. Artist and author Kimberly Santiago takes the guess work out of “how did she do that?” by breaking down her process for assembling beautiful mixed media artwork. Follow manufacturer’s instructions to make copies of pressed leaves on the Rub-Onz Transfer Film. Set aside. Make copies of vintage lettering and cut into 3 x 3 squares, covering the entire panel and adhere with matte medium. Embellish by painting stylized tree branches with acrylic paints. Allow to dry. Transfer leaves to selected areas in the background. Draw into the trees and around the leaves with a graphite pencil. Paint a top coat of varnish. Allow to dry. With a fine tip black marker, draw a butterfly on Matte Dura-Lar. Make a copy onto the Computer Grafix Film and adhere to the acrylic panel. Use this as a guide and with watercolor paints create a butterfly on watercolor paper. Remember your butterfly painting doesn’t have lines, the Computer Grafix overlay will provide the black lines. Adhere Double Tack to the back of the acrylic sheet, line up and lay on top of the watercolor painting. Adhere Double Tack to the back of the piece and adhere to the panel.